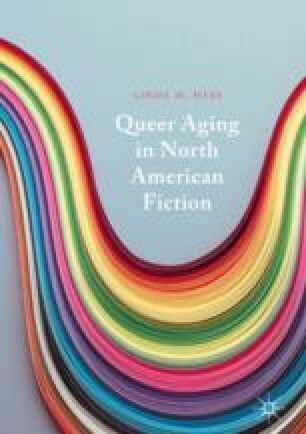 In the Introduction, Hess points to an absence of aging LGBTQ persons and narratives of queer aging within aging studies and queer studies alike, even though age and aging frequently serve as important narrative elements in queer fiction, and queerness can open up alternative ways of thinking about aging and the life course. Introducing temporality, futurity, productivity, success, and failure as central tropes that shape understandings of growing older, Hess focuses on a development in the representation of queer aging from the 1940s to the 2010s in North American fiction and argues that narratives of queer aging are particularly apt at casting new light on the ways in which growing older is perceived and conceptualized in North American culture. CBC. n.d. Timeline: Notable Events in LGBT Canadian History. http://www.cbc.ca/doczone/content/interactives/gayrevolution/timeline/default.htm. Accessed 12 Jan 2018. Government of Canada. 2015. Canadians in Context: Aging Population. Employment and Social Services Canada. http://publications.gc.ca/collections/Collection/H39-608-2002E.pdf. Accessed 14 Sept 2015. Ortman, Jennifer M., Victoria A. Velkoff, and Howard Hogan. 2014. An Aging Nation: The Older Population in the United States. US Department of Commerce, Economic, and Statistics Administration. United States Census Bureau. https://www.census.gov/prod/2014pubs/p25-1140.pdf. Accessed 14 Sept 2015.